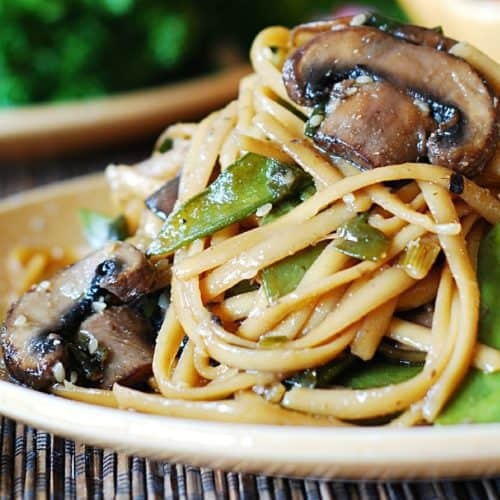 Spicy Asian Noodles with Mushrooms and Snow Peas – easy recipe to make Asian-style noodles at home. You don’t need any complicated ingredients. 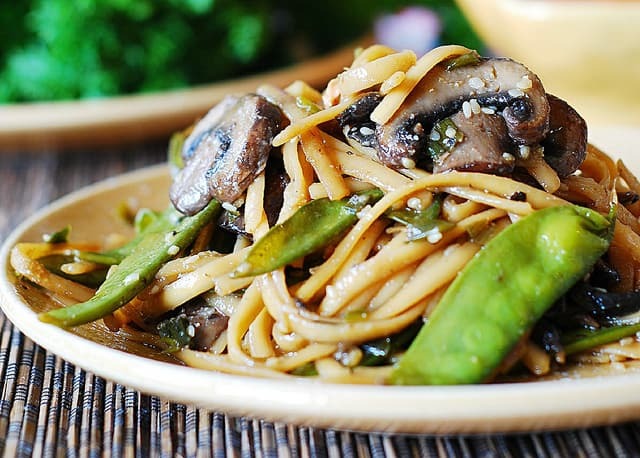 This recipe uses basic ingredients to create tasty Asian meatless noodles at home. 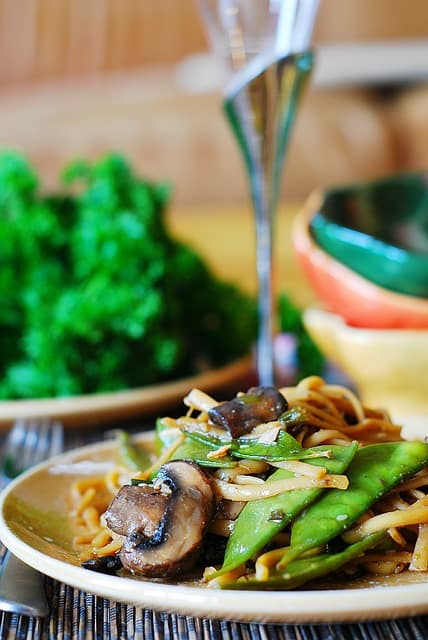 For the last several weeks, these spicy Asian noodles with mushrooms and snow peas became my staple dish on Monday nights (or any other days that are similar to my hectic Mondays). It’s very easy to prepare; takes at most 40 minutes from start to finish, and it’s very tasty. The dish is versatile – you can eat it as a vegetarian version, or you can add already cooked fish or meat to it. This is my perfect recipe for Monday nights. If your Mondays are anything like mine (busy from 9 to 5 with reports and excel spreadsheets at work, plus everybody is trying to catch up with me at the same time), then you will thank me for this recipe. It’s mindless, simple, you can do this dish on an auto-pilot, because this recipe does not require much thinking or fiddling. And, in the end, you’ll surprise yourself with the dish that’s quite excellent in flavor. Green onions, sesame oil, sesame seeds, Sriracha sauce and fettuccine pasta. 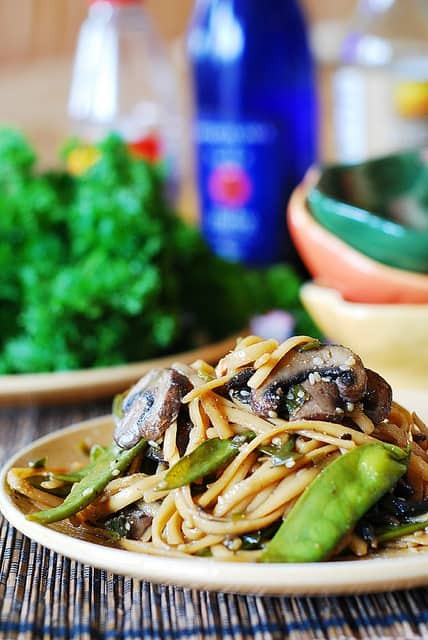 Yes, those are some of the delicious ingredients to make these Spicy Asian Noodles with Mushrooms and Peas. Meatless recipe. Heat sesame oil in a large frying pan on medium-high heat. Add chopped green onions and sesame seeds and saute for 2-3 minutes. Add sliced mushrooms and cook for another 2 minutes on medium heat. Remove the pan from the heat, and add soy sauce, honey, chicken stock, Sriracha – mix everything well to combine. In a separate pan, boil snow peas 3-5 minutes until tender but still crunchy. Drain. In another large pan, bring water to boil and cook pasta for 10-12 minutes or longer (according to pasta instructions) al dente. Drain. Add drained snow peas and pasta to the vegetables and sauce in the large frying pan with vegetables from step 1. Mix everything well and heat everything through on medium-low heat. Can this be kept overnight in the fridge? Yes, you can refrigerate it for up to 4 days, in an airtight container. Just made this, so good !! Just made it!! Nice and easy! Thank you!